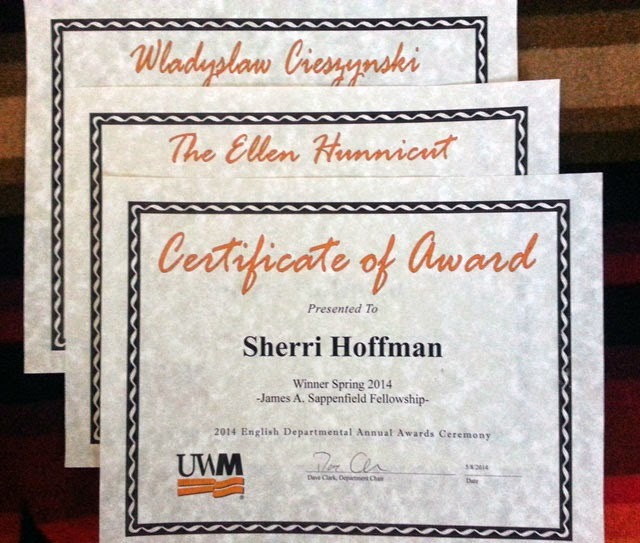 I am pleased and honored to have received three awards at the University of Wisconsin-Milwaukee 2014 English Departmental Annual Awards Ceremony alongside some talented and esteemed graduate students in the English PhD and MA programs. It is an honor to be recognized for my writing as well as my academic work at UWM, and I am deeply grateful to the donors who endow these awards. "The author's panoramic rendering of the characters and the two communities where these opening sections take place, as well as the vivid sensory detail on each page, were impressive and exciting." 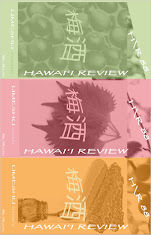 Contest recognizes a previously published work, poetry, fiction, or nonfiction by a UWM student. Submitted anonymously. The award recognizes academic excellence; recipients are selected by department faculty within each graduate plan: Literature and Cultural Theory; Rhetoric and Composition; Creative Writing; Professional Writing; and Media, Cinema and Digital Studies. I have just completed my first year of coursework in the PhD Creative Writing program. My thanks to the department faculty for their recognition and enduring support. afternoon, trying to write a poem. Waking up under the stars.